There's two-person outfits such as The White Stripes, The Black Keys and Local H. And before them North Carolina's Flat Duo Jets were rocking it duo-style. But drummer and guitarist Yattie Westfield could have everyone beat. 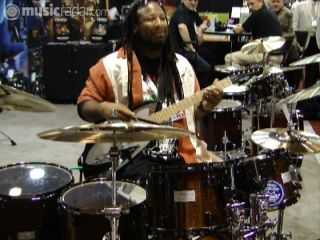 We caught Westfield's utterly amazing demonstration at the Mapex stand, where he laid down a solid, spirited groove while dishing out some bold metalliac riffage. "Yeah, I took The White Stripes down one member," Westfield told MusicRadar. "I didn't really plan it out or anything. One day I just sat down at the drums with my guitar and let it fly. I realized, Hey, I don't need other musicians - I can do this all my myself." Westfield, who hails from Cleveland, Tennessee, has just finished recording his debut album. We'll be looking for it. And we hope to see him on tour soon, too. Goodness knows, he can travel light!